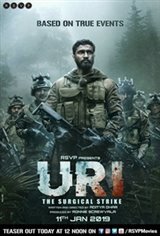 Based on the true events of 2016, when the Indian Army avenged a deadly terrorist attack by carrying out a surgical strike. "Excellent movie - loved it." "True story, faithfully and tastefully depicted. Excellent cinematography, clear subtitles for those who don't understand Hindi."